Flipping through the latest Crate and Barrel catalogue, I noticed under the tony leather ottoman a familiar looking book. In fact, it’s one I have at work and home: the exhibition catalogue for Calder Miro. I suspect I noticed this detail since it has personal meaning for me; I work at the Phillips and the first exhibition I gave tours of was Calder Miro. But I can’t get over how often I see the museum, the collection, and exhibitions mentioned in my life outside of work. 1. Amélie. This one of my favorite movies and, in my opinion, one of Jean-Pierre Jeunet’s best films (though Delicatessen is a close second). Where’s the Phillips reference? Remember her neighbor, the man with the brittle bones who paints and repaints an artwork every year? Well—he was painting Renoir’s Luncheon of the Boating Party! 2. Daniel Silva’s Gabriel Allon series. My dad loves mysteries, and he pointed out to me that Silva often refers to the Phillips in his books. In The Messenger, Silva introduces Sarah Bancroft, a fictional curator, who works at the museum and reappears in a number of other Gabriel Allon books. In his latest novel, The Rembrandt Affair, the art thief Maurice Durand muses how he once considered stealing Luncheon of the Boating Party from the museum’s walls! 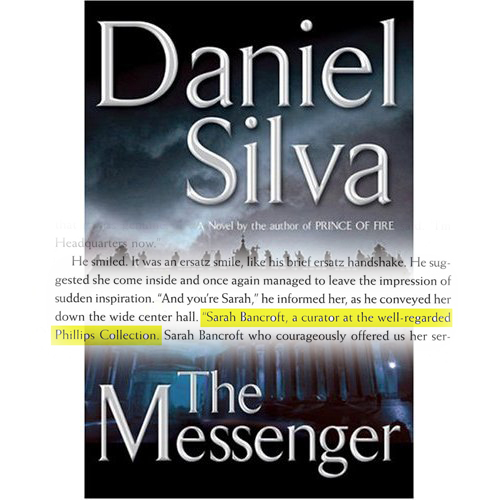 Cover for Daniel Silva's The Messenger (Signet, 2006). Note the yellow highlight on page 141. It mentions the Phillips! 3. Batman—that’s right—Batman! I’m generally more of a Christopher Nolan’s Dark Knight fan than the Tim Burton kind, but I’ll admit, I was excited when I rewatched the 1989 film and noticed a link to the Phillips. Remember the scene where Jack Nicholson’s Joker enters a museum with his crew and vandalizes artwork? He takes a brush and paints “Joker was here” on a reproduction of one of the Phillips’s paintings by Edward Hopper, Approaching a City. This entry was posted in Experiment Station and tagged hopper, luncheon of the boating party, permanent collection, popular culture, renoir. Bookmark the permalink. Great post, Brooke! Amélie is one of my favorites, too. I remember how thrilled I was when I noticed Degas’s “Dancers at the Barre” hanging above a fireplace mantel in a scene from “The Band Wagon” starring Fred Astaire. Astaire plays Tony Hunter, an out of work dancer who gets involved with the production of a new musical. Long story short (and skipping over the drama and romance), when funding for the show is pulled Astaire sells his art collection, including the Degas painting, allowing the show to go on. I had no idea about that reference Meg. I’ll have to see The Band Wagon. Thanks so much! Thank you for mentioning Gabriel Allon, Sarah Bancroft and Daniel’s books. We are big fans of the Philips Collection, and apologize for Maurice Durand’s errant ways. Some day we will need to have Daniel do an event there. I’m flattered you read the post and so pleased you enjoyed it! As I mentioned, my father is a BIG fan of Daniel’s work! And it was so great to see the museum pop up in his writings! I’d love to meet you next time you’re at the museum and walk through the galleries with you. It would be so fun to get your take. If you’re interested, send me an email directly at brosenblatt@phillipscollection.org. 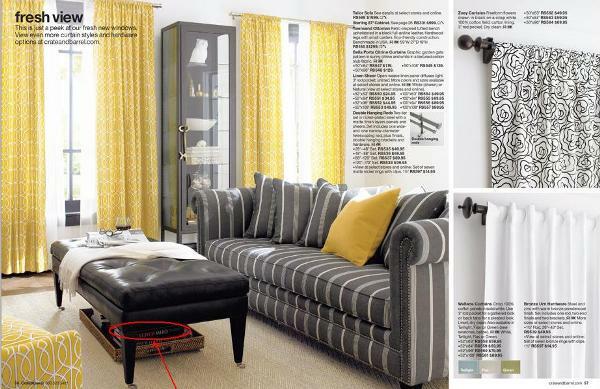 Calder/Miro makes another appearance in Design Within Reach’s latest catalog, too! Clearly it is the exhibition catalog interior decorators prefer.